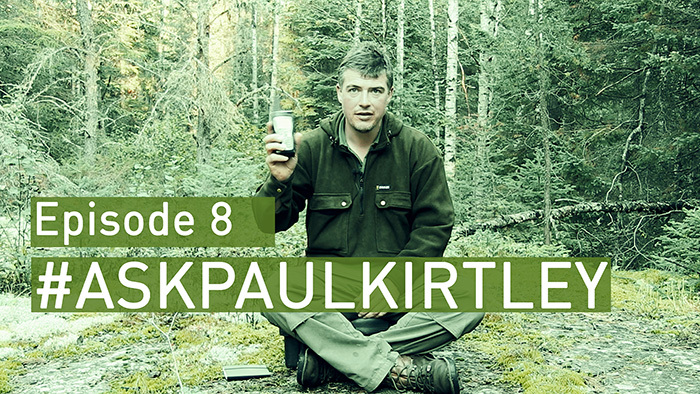 In Episode 8 of #AskPaulKirtley, I offer some thoughts on preppers and prepping, make some suggestions for helping kids who get frustrated with learning bushcraft skills, suggest some quiet places to camp and forage in the UK, give some specific advice on aspects of firelighting, fires and leave no trace as well as provide some book recommendations for bushcraft and wider campfire reading. The videos will be uploaded my YouTube channel as well as embedded here on my blog. The audio-only podcast version is available on here on Soundcloud and will be added to iTunes and other popular podcast directories in due course, as well as available here on this blog. Leave me a comment below. Let me know what you think. I read every one. re preppers: my family are bushcrafters/preppers,last year we were subject to a sanction from the DWP for no good reason (later on appeal found in our favour) meanwhile we faced as a family of 2 adults and 5 kids no money comming in for 9 weeks. being preppers allowed us to survive,our food stocks and fuels left us very comfortable,we had our veg garden and with some hunting and foraging it was good to see that it all paid off,we never went hungry and didnt need to visit a food bank. keep up this excellent blog,we all,love it. welcome home. Thanks for the latest APK. Full of interesting stuff as usual. The part about Leave No Trace was particularly pertinent to me as I arrived at what was a lovely camping place this weekend to find it full of rubbish and a burnt out fire circle. The soil there is so thin I had a lot of difficulty repairing the damage over the loose scree type rock and I wish I knew how to get the message across to whoever used the place that it’s not ok to damage the soil. All sorts of traps, cameras and dragons teeth sprang to mind. I settled for clearing it up and hoping they’d learn by example. Looking forward to the next Tree Seminar, when is it? i was nearly as green as your trousers watching you blog from the Northern forest! i very much enjoyed it though and i’m really looking forward to your film of the trip – can’t wait for that! i can literally see the benefit you got from being “unplugged” for a little while, i hope it doesn’t wear off too quickly. P.S. That book you recommended about inuksuit looks really good, it’s on my wish list. Love the rationale for sensible prepping. We do love to label, categorise and judge. To the parent worried about there kid’s behaviour, kids get frustrated for a number of reasons and identifying the reason will help you determine the best way to handle it. Remember kids these days hardly get any freedom to play, large chunks of their time are scheduled, before school, in school, after school clubs and ridiculous amounts of homework, paid activities, organised sessions etc. There are ‘NO BALL GAMES’ signs everywhere, kicking a ball in the street is a high risk activity in most places because of cars on roads, cars backing out of drives, cycling is often an all padded affair. They have to express their autonomy somehow, often gaming is the way, and not doing what your Dad/Mum/teacher just told you what to do is another. If that’s the reason, back off, get on with your own thing and let them play, they’ll come over when they are good and ready. If they want to be able to do something and can’t and get upset about it, relax, no one died of frustration. But they do die inside from suffocation, from emotional micromanagement and the modern obsession with ‘upset=bad’. How often does a child see us outside our comfort zone, trying something new and failing? When they do, how do we react? Probably the same way ….It’s called being human and embracing the oppurtunity to watch your child grow as a person, through those frustrations lets you sleep at night because you know they won’t implode emotionally and they will get it all under control. and as I live just below Grand Forks B.C., Canada, I assure you I feel kindly to the folks North. Kindest Regards to an INCREDIBLE EFFORT! and the deer and other animals become prolific. Lodge-pole pine require fire to reproduce.! Can I just say what a great episode this is. As an ex fighter pilot and current full time martial artist ( both mentioned in your first answer) I am astounded at the quality of your answers, they are reasonable, thought through, intelligent and articulate. Simply want to say – well done for this first class series, thanks. Thank you Mick. Your feedback means a lot to me. Much appreciated. Regarding campfire leave no trace its a real problem in some of the places I visit where uneducated idiots just leave their mess, it really saddens me to see it and just a few weeks ago spent a good hour cleaning up after someone. Regarding the question of children and bushcraft, and if Gavin can see this.. I think the key to getting children outdoors is to inspire them and make it fun, we know that when children have the opportunity to connect with nature they most often become fascinated and given the right nurturing this will most ofyen grow. As a parent myself and as a qualified Woodland Activity Leader it is often worth considering allowing people whom have this regular interaction with children have time with them, ie, a local forest school group or by attending childrens bushcraft courses, or parent child courses. A good Forest School Leader has a wealth of games, experience and knowledge of learning types to bring to the table. Whilst not all will be hands on bushcraft I strongly believe that the child whom is inspired by our natural world will wish to learn more, they will alsp become more comfortable over time in this environment and hence become gradually more focused on wider skill sets. So to start, children need fun, patience and inspiration, they are most often Kinisetic learners so hands on and up close is always a winner. Don’t try to teach them everything yourself, the advantage of peer learning and sharing can not be underestimated for any age group, especially children. Given opportunities for children to learn forest skills you can allow them to teach you something, I know children that have told their parents how we always use cutting tools to the outside of our bodies, having seen apparent bushcraft enthusiasts know no better and children adopting these techniques right from the off. Bring them in so that they have a sense of learning together, be happy to say I don’t know, let’s find out together, learn to use wild flower keys together to identify etc, children respond very well to being part of the learning as opposed to always being taught, they get so much of this in the classroom, make the outdoors different. About children and bushcaft I agree when you say to no force them. I have a boy and a girl and first try to teach them the way of nature and then if they ask me to light a fire with ferro rod so I let them to try with something they cannot fail (vaseline soaked cotton balls per say), because failing in firelighting get frustrating. With me is working so far….